When the Luxembourg-born product designer Petz Scholtus met hotel manager Mari Rodríguez, she was finally able to leave her drafting board for a longed-for career in eco-tourism. 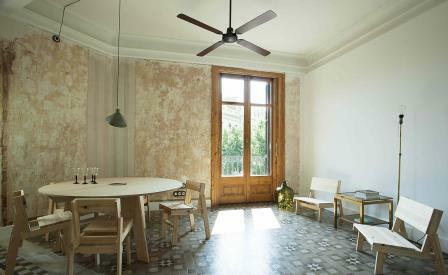 The two purchased a trio of century-old townhouses in the Catalan Modernist tradition and knocked them through, installing a sustainable interior heavy on recycled woods and lighting, which work quietly against the original mosaics, frescoes and cornicing. They named the new inn for the Catalan ‘lloc’, meaning place, with a nod to the English ‘yolk’, a metaphor for the centre of things. The umlaut harkens back to Scholtus’s previous design brand, Pöko, just to reaffirm the team’s design credentials. On the rooftop terrace, the ‘cultura’ part of the experience comes into play, offering guests and locals alike a place to mingle far above the traditional tourist fray.